Tierra Robada from the sky. 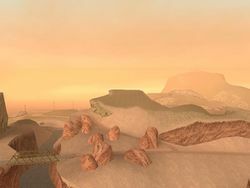 Tierra Robada, which means Stolen Land in Spanish, is a semi-arid region of San Andreas in Grand Theft Auto: San Andreas. It is located in the very northwestern portion of the map, and is home to the towns of Bayside, and the marina, El Quebrados and Las Barrancas. It is physically separated from Bone County by the Sherman Dam and the Sherman Reservoir, with only a land bridge in the north connecting the two land masses. 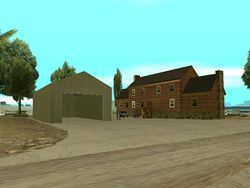 To the south of Tierra Robada is San Fierro. Tierra Robada's southern tip also provides the land area for the Robada Intersection, which is the major interchange connecting the highways servicing Tierra Robada, San Fierro, Las Venturas, and Bone County. Tierra Robada is partially based off parts of rural areas just outside the cities of Berkeley and Oakland. Mike Toreno's ranch in Tierra Robada.